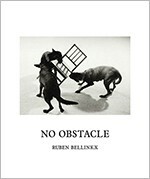 No Obstacle, No Image makes reference to the fact that the majority of Bellinkx’ projects are extremely hard to realize. Whenever he presents his drawings and models, the public is always surprized to learn that these are the precursors of still to develop projects. Bellinkx always pushes the limits of what can safely be realized: the path along the realisation of his projects is covered with potential failures and tricky obstacles. These obstacles are a necessity in his work. This publication covers the last ten years of Bellinkx’ artistic practice, and offers insights into his preliminary works, his drawings, models and final realisations.